DocuSend works with any QuickBooks version and all accounting software that outputs to PDF. Did You Know -DocuSend isn't just for mailing invoices. It's great for letters too! DocuSend®, powered by Mail Technologies Inc (MTI), is proud to announce the launch of their DocuSend for QuickBooks Online app. DocuSend's web-based service automates the printing and mailing of invoices, billing statements and other important customer communications using proprietary PDF technology. Many of DocuSend's clients use QuickBooks Online for their accounting software. "With over 1.8 million customers globally using QuickBooks Online to manage their accounts receivable, it was a natural progression to offer an app that auto-uploads invoices to DocuSend for printing and mailing," says Dave Drum, President, MTI. The DocuSend app is specifically designed with the same aspect and qualities of QuickBooks Online, minimizing any learning curve and making it very easy to use. QuickBooks Online users simply launch the free DocuSend app in the Intuit App Store and their customer invoices are prepped in seconds and mailed within one business day. There are no minimums, monthly charges or contracts. DocuSend users also receive access to their own DocuSend Dashboard and Image Bank, providing secure access to their document mailing history. The Image Bank is an archive that provides six months of electronic storage and instant access to mailed documents for immediate viewing, reprint and distribution. DocuSend options include perforated paper, remit envelope, color printing, and the ability to add a generic PDF insert to your mailings. Recent additional enhancements include certified, foreign and oversize mail. DocuSend has clients throughout the USA that rely on the cost effectiveness and time saving benefits of using the web-based service to print and mail customer invoices and other important communications. MTI, Inc, with corporate offices in Rochester, New York, was founded in 1991 by Jim Stewart, CEO, to provide large volume financial document processing to financial institutions, cable companies and other businesses, where accurate bill rendering is integral to their success. DocuSend was launched in 2015 to serve the small to mid-size volume market. Agreement provides DocuSend print-to-mail services to TALogic customers using their MyCommunityTM property management software resulting in reduced operational expenses, increased efficiency and expedited receivable revenue. DocuSend®, powered by Mail Technologies Inc (MTI), is proud to announce a reseller partnership with Tampa Automated Logic (TALogic). DocuSend's web-based service, which automates the printing and mailing of invoices, billing statements and other important customer communications using proprietary PDF technology, was deemed the perfect fit for TALogic's user base. TALogic, a Tampa, FL company established in 2000, provides MyCommunityTM, their premier online community management software for the property manager, condo and homeowners associations, and has clients throughout the United States and two other countries. "With all the regulations and notifications requirements facing community management associations, it's a complex job to keep everyone informed," says Ron McCarthy, President of TALogic. "Partnering with DocuSend provides an automated way for property managers to get important communiques in the mail quickly and at a great price. My clients also needed a service that could handle certified and foreign mail." Using DocuSend, letters, invoices and other important documents are prepped in seconds and mailed within one business day. There are no minimums, monthly charges or contracts. Some of the many options include color printing and the ability to include a generic PDF insert globally. DocuSend also features an automated service for certified mail (a legal requirement for property managers and homeowners associations in some states). Included at no additional fee is access to a personalized DocuSend Dashboard and Image Bank, which provides secure access to individual document mailing history. The Image Bank archive provides six months of electronic storage and instant access to mailed documents for immediate viewing, reprint and distribution. "Homeowners associations are one of DocuSend's fastest-growing segments," according to Dave Drum, President of MTI. "We are happy to provide a service that makes this important industry more efficient and less reliant on manual processes." DocuSend has clients throughout the USA that rely on the cost effectiveness and timesaving benefits of using the web-based service to print and mail customer invoices and other important communications. MTI, with corporate offices in Rochester, New York, was founded in 1991 by Jim Stewart, CEO, to provide large-volume financial document processing to financial institutions, cable companies and other businesses, where accurate bill rendering is integral to their success. DocuSend was launched in 2015 to serve the small-to-midsize volume market. MTI is a finalist in the Greater Rochester Excellence and Achievements in Technology (GREAT) awards in the Technology Services category. Automated Web-based Document Solution works in conjunction with QuickBooks and other accounting software systems to provide mailing of invoices and tracking of mail activity. ROCHESTER, N.Y.; May 27, 2015 – Mail Technologies, Inc's (MTI) DocuSendSM is a web-based service for managing and distributing customer invoices and documents. This complete document delivery process provides materials, printing, inserting, first class postage, mailing, and reporting for a low, pay-as-you go price. As QuickBooks Billing Solutions for mailing invoices ends on June 30, 2015, existing users need an alternate, cost effective mailing option to fill the impending void. DocuSendSM offers that solution. Easily upload your PDFs saved from QuickBooks and within one business day your invoices are printed, folded, inserted and mailed. You pay as you go and there are no minimums or membership service fees. Track your mail activity on the dashboard in the DocuSendSM portal. DocuSendSM offers real value to users of QuickBooks Billing Solutions who have relied on the service to mail their customer invoices, says Jim Stewart, CEO, MTI. The DocuSendSM process takes literally a few minutes to select document options, upload a PDF file, approve for printing and make your payment. Included at no additional cost are the DocuSendSM dashboard portal and the Image Bank, providing users with a mailing history and instant access to six months of electronic storage of processed documents for immediate viewing, reprint and distribution. And coming soon – a remittance envelope option plus mail delivery tracking to see the progress of your documents through USPS. MTI, Inc, based in Rochester, New York, was co-founded in 1991 by Jim Stewart, CEO, to provide financial document processing to financial institutions, cable companies and other businesses, where accurate bill rendering is integral to their success. DocuSendSM is not a service of, or in any way affiliated with, QuickBooks or Intuit. 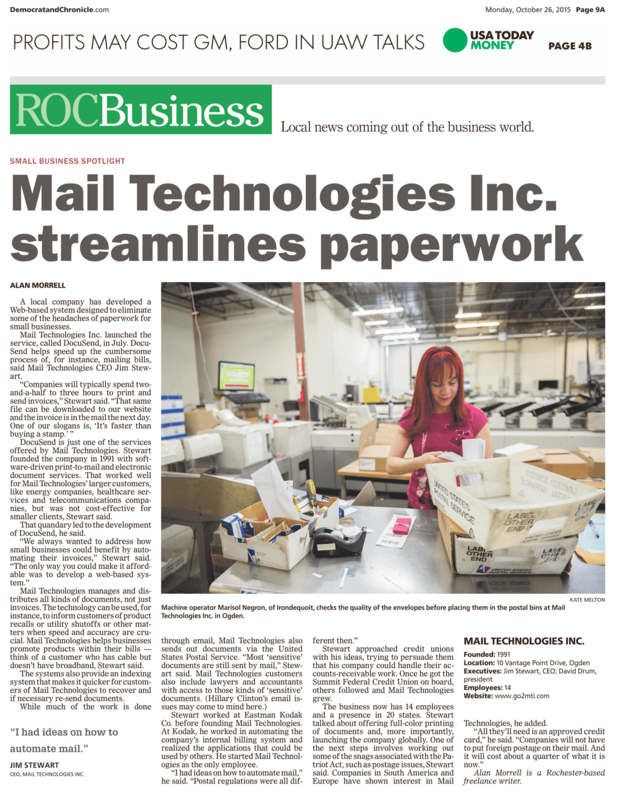 ROCHESTER, N.Y.; March 5, 2015 – Mail Technologies, Inc (MTI) introduces DocuSendSM, a proprietary process for managing and distributing customer invoices and documents. The web-based service is a complete document delivery process that manages printing, inserting, mailing, inventory, and reporting for a low pay-as-you go price. MTI has specialized in printing and mailing of documents for a variety of high-volume businesses for over twenty-three years and is now bringing its expertise to small-to-midsize companies, with services normally offered only to producers of large quantities of mail. The DocuSendSM product allows any business using software that outputs to PDF to outsource their invoice, statement, and document mailing processes. The turnkey service will reduce costs for any size company currently producing documents internally. And just as companies like PayChex® have provided payroll services to thousands of businesses across the U.S. for decades, DocuSendSM offers the same outsourcing benefits for document rendering and distribution. "DocuSendSM offers real value to companies who otherwise might not be able to take advantage of larger volume processing and postage discounts. It's simple to implement, easy to manage and eliminates the task of internally generating customer statements. It frees up time to focus on core business priorities," says David Drum, President, MTI. The DocuSendSM process includes printing documents on standard 8.5" x 11" paper, folding and insertion into windowed mailing envelopes, and applying first class postage. Options include plain or perforated paper. The online process takes only a few minutes to select from a simple menu of document specifications, upload a PDF file, approve for printing and make a payment selection. Documents are mailed within one business day, and there are no minimums or contracts. The online pay-as-you-go feature eliminates the need for monthly invoicing and cumbersome payment options. Secure electronic document delivery is also available and can be included in the same upload file as the mailed documents. Additional benefits include the DocuSendSM portal and the DocuSendImage BankSM. The portal provides secure access to the document mailing history and includes counts of mailed and emailed documents with a cost summary. The Image Bank provides six months of electronic storage and instant access to mailed documents for immediate viewing, reprint and distribution. If the court upholds the increase as temporary, the exigent prices would need to be rolled back around August/September 2015. It would be challenging for both the Postal Service and the mailing industry to support two pricing software changes in one year. So the Postal Service would likely wait and make one price change incorporating both the exigent roll–back and any CPI increase available at one time. If the court rules the increase as permanent, the USPS would likely move forward with a CPI increase. But by the time the ruling is out, the implementation couldn't happen until at least late March or early April. One of the most frequent questions we receive from clients planning the coming year's marketing budget is, "What's going to happen to postage prices?" Since the CPI price cap for postage price adjustments was established, that has usually been an easy question to answer. But the uncertainty around how the court will rule on the exigent prices has made such predictions much more complicated this year. The PMG's announcement takes away a little of the uncertainty and provides mailers with at least a couple extra months before we need to deal with another price increase.